I don’t live in an area that is suitable for peaches trees. Growing up my parents had peach trees and mom would can peaches every summer. She liked making pies and canned plenty of fruit to make pies with. Fresh peaches are always the best for pies and cobblers but my food budget doesn’t allow me to indulge in fresh peaches to cook with. Fresh peaches are always enjoyed eaten when in season. This recipe can be adapted to sugar free by buying sugar free canned peaches and using sugar substitute in the recipe. 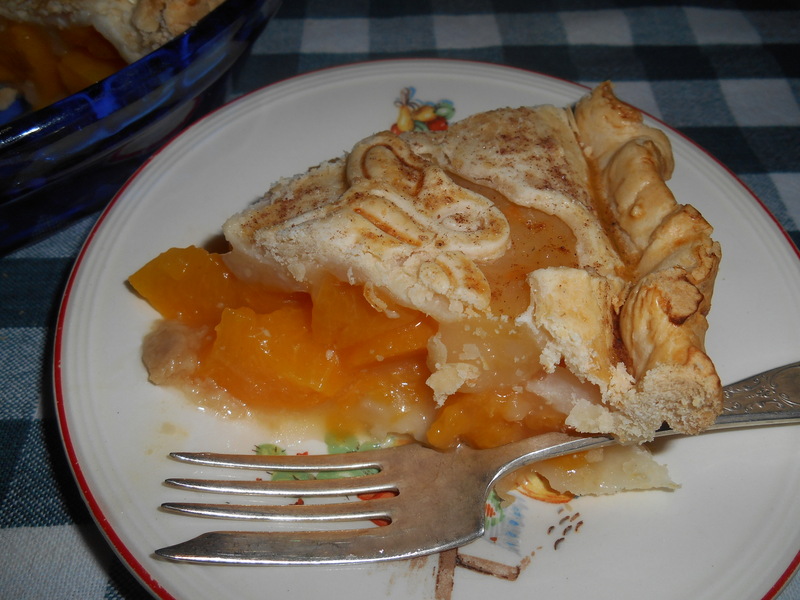 I used light canned peaches for this pie and tasted the filling to make sure it was sweet enough. There was some extra cans of peaches lurking in my cupboard that I should use up. Since it had been a long time since I made a peach pie, it just sounded good. I thought of those pies that was made from peaches that my mother canned. They were never over sweet or saucy like commercial pie filling. She filled the pies with more peaches then what is in a can of pie filling. I dug out an old cookbook from the 1950’s and found the recipe that she would of used. When I was young my mother only had 8 inch and 7 inch pie pans. A 7 inch pie pan held only one can of commercial pie filling. In today it is hard to find a 7 inch pie pan unless you find one in a thrift store or save the aluminum throw away pie pan from a small bakery pie. Today 9 inch and 8 inch pie pans are sold. The 9 inch holds 2 cans of pie filling nicely. I wanted to use my 9 inch deep dish pie pan so the pie would not boil over into the oven. My mother always used a quart of peaches for a pie. I had a 29 ounce can and a 15 ounce can which turn out to fill the 9 inch pan nicely. Two 15 ounce cans will make a 8 inch pie. I used the whole can including the syrup that the peaches was canned in. This was the way my mother did it. She always didn’t want to waste the sugar that had been used to can the peaches with. She always drained the juice into the sauce pan first then set the peaches aside to add later to the thickened syrup. Normally I make my own pie crust but I was baking in the middle of the night and did not want to wake everyone up with my food processor so I used pre-made pie dough from the grocery. I also use a pastry cutter to make the butterflies on the top. I found these cutters over the last year at Walmart during the holidays. They were very inexpensive and picked up the Christmas ones after Christmas marked down. They don’t sell them year around. The butterfly came from Easter. They came in package of 4. You can find them online but they are several times more expensive than what I paid for them. I think I only paid less than $3 a set of 4. They are my coolest new thing to bake with and they make charming little cookies too. Here is a video from William Sonoma that shows how to use them. I didn’t get a regular leaf in my assortment last fall to make that pretty petal crust. I always look at William Sonoma on line to window shop and that is where I first saw them. Then I saw them at Walmart and could not pass them up. Been using them on my pie crust ever since. Hmm… I bet the Christmas tree or Easter egg might make a nice petal. Drain the juice from the can peaches into a saucepan and set aside the peaches. Add all the other ingredients to the juice except vanilla and peaches. Cook on medium heat stirring constantly until thickened. Now add peaches and gently stir until peaches are heated through. You may taste to see if the pie is sweet enough. If not add a little more sugar to taste. Add vanilla just before pouring into pie crust. Crimp edges and make slits for steam to escape. Brush with an egg wash and sprinkle crust with a little sugar for a little crunch and sweetness. Cover edges with foil to keep the crust from getting too brown. Bake at 400 degrees for 10 minutes then turn down oven to 350 degrees then finish baking for 40 minutes. Until it is golden brown. Sound yummy! I also like my pies with more fruit than the canned pie fillings have. 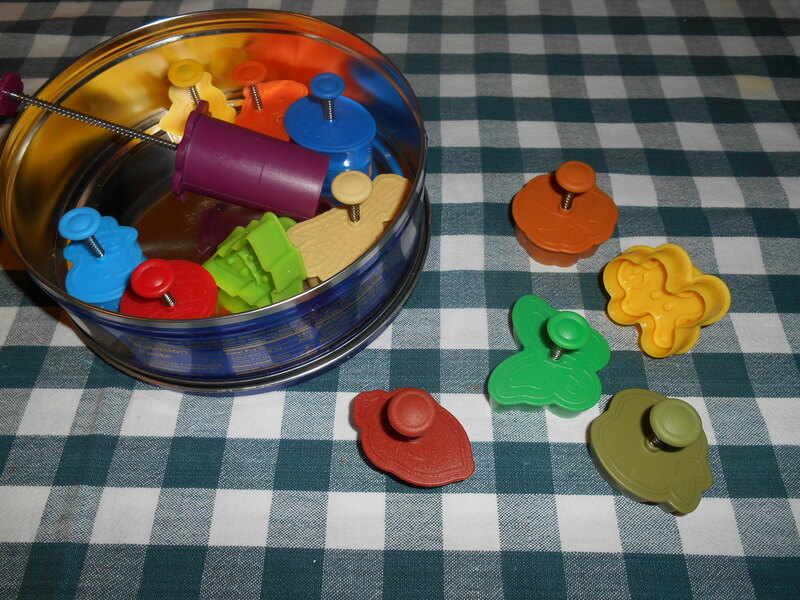 I like the idea of using the canned fruit to make a pie. This will definitely be added to my to do list. Thanks for sharing. I hope your husband is doing better now. The pie is really good because you can really taste the fruit. It also smells good like a peach. Sometimes I forget how good things can taste because we don’t get all the flavor in commercially made filling. They load things down with sugar and artificial flavors. The pie looks wonderful and I love your telling how your mother made them. We should be having Georgia and North Carolina peaches here in the Cincinnati area farm markets soon, but this would be great for all of the times when the good fresh peaches aren’t available. I grew up in Akron and we had peach trees. Almost everyone then had peach trees, cherry trees and apple trees. It was wonderful in the spring time when they were all blooming. Produce is expensive here in South Florida so I just buy what we eat. My mother was not much of a cook but she did like making pies. She did lots of canning from her garden and I had to help. Her sisters were very good cooks and they took time to show me. Thanks for stopping in. I follow you on facebook. Haven’t seen you for a while on DK, but I follow you here, so I thought I’d say hello. 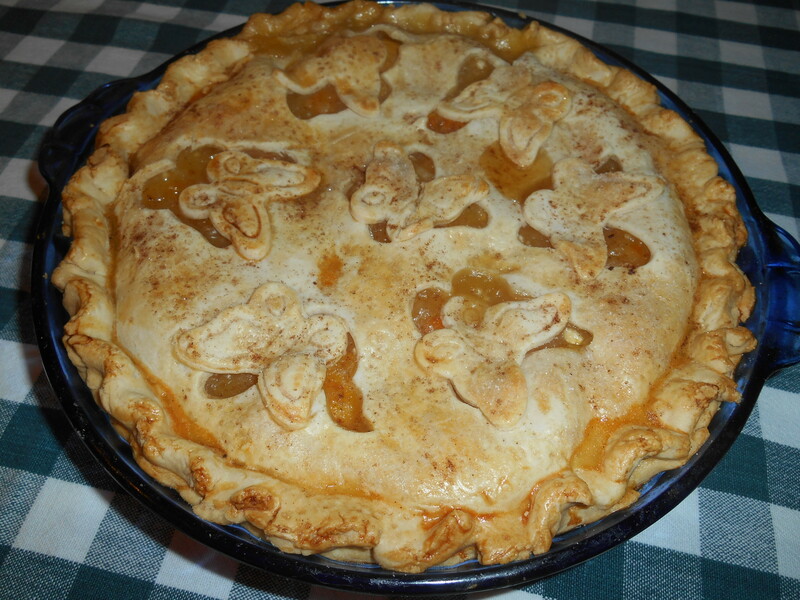 I love peach pie, so I think I’ll make one and take it to a barbque on July 4th. It sounds delish. I had a few health issues but back on the mend. I still have to finish that quilt. And thanks for stopping in. All of it became over whelming with have the kids here. Thanks for your comment. Some times you just get hungry for some. I will have to keep an eye out for those cutters! Great looking pie crust! Thanks for your comment. This is one of the recipes that I have posted that gets many views everyday. My mother had peach trees when I was growing up and we would can quarts and quarts of peaches each summer for a couple of weeks. This was one of recipes the canned peaches was used for. I am just surprised that this recipe is not real common because it shows up early in search engines. On another note what do you do to get all the comments and likes? I have been blogging for a long time and get 1-2 likes per post and no comments. Just that I need to sign up with some websites etc. and spend money to get more likes….did you do that? I am flattered that you asked. This is a free account and I have been doing this for a long time. I just reached a milestone of 1000 followers this week. I don’t pay attention much to that so I was surprised to see that many followers. This recipe was picked up in Pinterest and is still circulating. It has over 6,000 views so that moves me up in the algorithms list when people do internet searches for peach pie. (I just looked that up in the stats) That also brings in traffic for this recipe. This is an old fashion inexpensive recipe that can be made year around. I have other recipes which this has happened to and have remained popular. I guess the food blogger gods smile on me every once in a while. It also helps to follow other food bloggers and take time to give them likes. I make comments too when I have time. I use the reader for that most of the time. I have a very small food budget so I enjoy reading other food blogs. I let them know I like what I read. On my list to make this weekend! I can’t wait! yummy yum! Well, I finely reached 1000 followers. It only took me 6 years. LOL…I hope you are doing well. Thanks for taking the time to stop in. Good morning and hopefully where you are it is nice and sunny too. Congratulations on the 1000 followers ! That is awesome….. Thank you too for your info on your blogging. You will like the peachy flavor from all the peaches in the pie. Commercial pie filling is more sauce and less runny. This pie is what your grandmother would have made. Thanks for your comment. Thanks for your comment. I hope you enjoy the time together in the kitchen. I am honored that you are using my recipe. I love the little butterfly decorations! AND,I love knowing that I’m not the only one out there in my kitchen at 3 a.m. It is cooler to bake at night in Florida during hot weather. I do my best work at night. Thanks for looking at the pie recipe.